There was a hell of a lot of bravado and false representation at around 8.04 pm on Tuesday night in the Stretford End half of the Old Trafford pitch. To anyone perhaps blessed with ignorance of Manchester United’s diabolical past week, you would have been forgiven for thinking this lot of players were together and exactly as the name suggests as they gathered for an unusual and rare pre-game huddle. Not much could be as far from the truth as that bygone utopia. This United squad is divided, dissenting, powderpuff and on another planet from the United side you come to expect. That is very much in keeping with the modern day footballer – whinging at the slightest bit of criticism, hiding behind the power of social media to escalate any issues and not showing even the most minuscule shred of respect for the badge or the hard working and paying supporter. 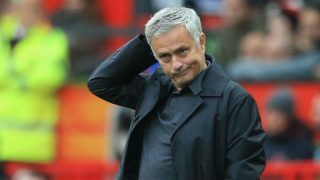 It is clear that Mourinho has lost the dressing room and normally, unless your name is Ed Woodward and you are terrified of a payout and another failure against his name, in those circumstances the manager pays the price, rightly or wrongly. That is where we are at currently, a manager who is the very picture and definition of a dead man walking and players who, on the whole, have downed tools waiting for the inevitable, maybe, and clearly what they want to see happen. We have a captain, who can barely muster a ‘hi, how are you’ supposedly mistakenly endorsing a social media post calling for Mourinho to be sacked by not reading the text. All this after the walking ego Paul Pogba lost any future captaincy role for speaking out. As long as the days of the week end in ‘y’ there seems to be a story revolving around United and player unrest: From Sanchez confiding in an ex-Arsenal player that he regrets his move (don’t we all) to Marcus Rashford getting a dusting down for not doing a serious warm down in Bern, United fans have to endure negativity on a daily basis and it is as guaranteed as light and dark. The lack of professionalism from EVERYONE at United currently is a joke and we have become everyone’s favourite circus act. Frankly, I am sick of it: I’m waiting on United fan Karl Pilkington to add us to his aforementioned new show the way things are going. You would have got incredibly long odds, probably as remote as Theresa May winning Strictly, on Luke Shaw being the embodiment of what it takes to be a United player and doing the badge proud this time last year. Like Patrice Evra, who pre-Valencia Instagram post was immeasurably inspiring, we have a left-back who seemingly ‘gets’ the club. Shaw was in the wilderness last year, his place at left-back was assigned to a makeshift in Ashley Young and a half-time substitution against Brighton and subsequent condemning from Mourinho seemed to have his fate sealed. Shaw just goes to show what happens when you don’t conform to the modern day prima donna stereotype, put the hours of graft in and play for pride. He has got back to the levels we saw before his leg break and has been the undoubted shining light this season. Lazarus approves. It is a sign of where we are currently at that I can only count the number of United players performing to anywhere near the expected standard on one hand alone. Shaw is joined by arguably Marouane Fellaini and David De Gea as players who have not disgraced themselves this season. How scary is that? De Gea aside, two players who were close to being out of the door, two who many would not have lost sleep over leaving as last season drew to a close, are actually the only ones serving the club with distinction and effort. The rest need to put aside any animosities or beef they have with the manager, remember their duty, which many would sacrifice a lot for, of playing for United and arrest a slide that is gathering serious momentum. Of course, we all know the far deeper rooted cancers crippling the club and United are a long way away from being in remission from their parasitic owners. Surely that makes it doubly important to avoid an on-field rot infecting the club further? Something has to change… That thing increasingly looks like Mourinho. However, the players need to look at themselves and how embarrassing this has all become. They are not immune or exempt from this mess, this circus, this sham. I believe in the old adage ‘put up or shut up’. These United players cannot be afforded the choice. They need to do both.